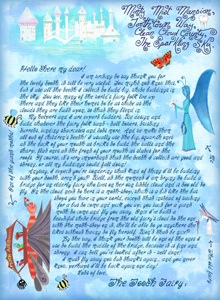 Below you will find full-length Tooth Fairy letters to print for your child. Our Tooth Fairy letters tell stories and they are completely free, but we’d be very grateful if you’d share a link to them on Facebook, Twitter, Google+ etc. Our website needs people to use it so that it can keep existing! Thank you. 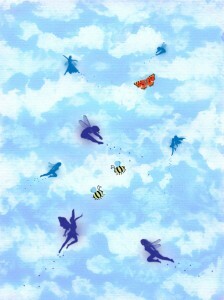 There are many myths about the Tooth Fairy and what she does with the teeth. Our letters are based on the idea that she uses them to build fairy castles in the sky. 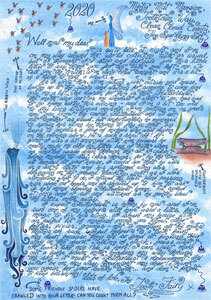 You can read more about what the Tooth Fairy writes in each letter by clicking on them. Need a back for your Tooth Fairy letter? 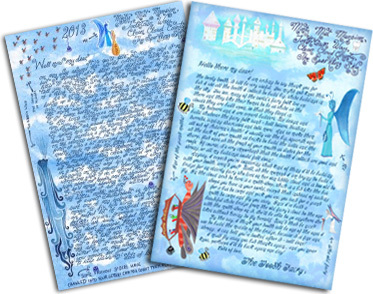 Finish off your Tooth Fairy letter by printing a pretty cloud and fairy pattern on the back. Then, when you can roll up or fold the letter and tie it with a ribbon, it will look extra beautiful. 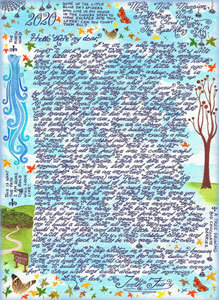 You can get a large image to print on the back of your letter by clicking here or on the picture to the left. After that, just right-click it and save it to your computer. The image is quite big and you may need to resize it to suit the dimensions of the paper you are printing onto – most modern printers come with software to do this for you. You could always watch this video. It will show you step by step how to make a letter from the Tooth Fairy using the printables on this page. If you want to be notified when we add new printables, you could always join our mailing list.